What's your favourite Sally Odgers book or series? I've just discovered Survey Monkey, a nifty site that lets me make... well... surveys! 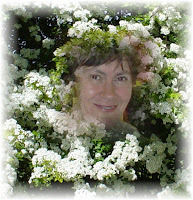 I'd love to know which of my books, or series, readers like best. You can vote (or just have a look...) by clicking this link. * Post that sentence along with these instructions in a note to your wall, and post your sentence in a comment here as well. Include the title of book and author. Here's mine... and no, I didn't cheat. 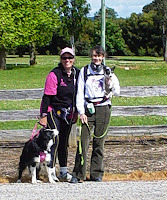 Today Tess (our elderly Jack Russell) and I were lucky enough to meet Deborah de Williams and her border collie Maggie, who are running for charity. They are attempting a world record run around Australia with 365 days on the road, and raising awareness of the search for a cure for breast cancer along the way. Deb's artist husband drives the wonderful pink support van. I was especially interested because of the tie-in with my book WILDERNESS (Eternal Press - www.eternalpress.ca ) which is also about a cancer survivor running for charity. To support Deb and Maggie and their team, check out www.runningpink.com.au .